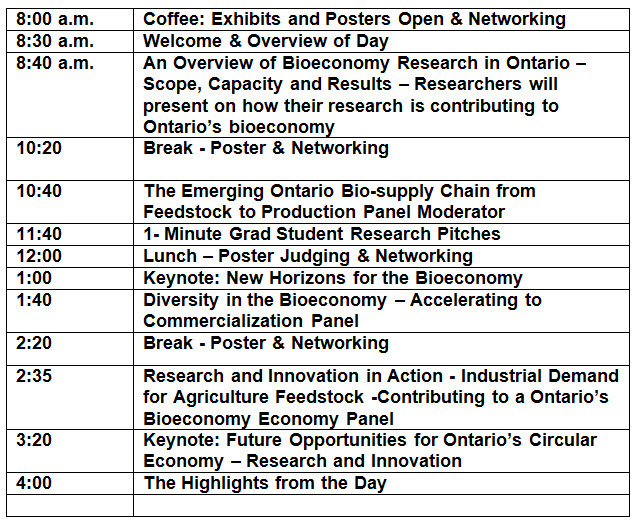 If you are interested in sharing, collaborating, networking, or learning about bioeconomy research and growing Ontario's bioeconomy - register today! Registration is free, but space is limited so sign up early! This event will also be available via webinar. Register online or e-mail ag.info.omafra@ontario.ca or call 1-877-424-1300. The registration deadline is October 20, 2016 although we may have reached capacity for attending in-person before then. Please indicate whether you will be attending in person or via webinar (WebEx), and whether we can share your name and email contact information in participants list. Looking forward to seeing you at the Holiday Inn at 601 Scottsdale Drive in Guelph on October 24, 2016! Registration and parking is free. Elin Gwyn at elin.gwyn@ontario.ca or Rebecca Moore at rmoore10@uoguelph.ca . Deadline: Monday, September 19th, 2016 by 4:00 p.m. Deadline: 4:00 pm on September 19th, 2016 by (Late submissions will not be considered). A review committee will select abstracts for poster display and notification of acceptance with poster guidelines will occur by e-mail by September 28, 2016.
biopharmaceuticals and cosmetics are included but functional foods and nutraceuticals are considered by the Food for Health Research Theme. Plain language training will be held on October 3. To RSVP or more information, contact Rebecca at kttadmin@uoguelph.ca. Posters are due to kttadmin@uoguelph.ca on or before October 18, 2016 in PDF and Powerpoint formats.